“What kind of name is that?” That’s what I thought as I biked by Lofty Coffee. But even though I thought it was a silly name, I remembered it & curiosity drew me back. While contemplating which coffee to try, a regular customer told me he drives from Mission Hills for their Turkish Latte. Well, that was enough for me! The Turkish Latte spiced with cardamom was amazing. Besides tasting great, it smelled fabulous every time I put the cup to my lips (cardamom does that). I’m now a convert & will drive all the way from Ocean Beach for a Turkish Latte fix. By the way, I was told “Lofty” refers to a higher quality, something to aspire to (but there also happen to be lofts in the building). 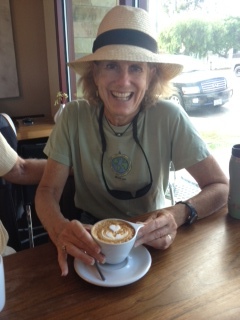 This entry was posted in Coffee shops in North County and tagged Coffee, Encinitas, Turkish latte. Bookmark the permalink.